Add onion and garlic to mixer bowl, chop for 3 sec/speed 5/MC on. Scrape bowl down. Add ghee, babas curry powder and garam masala. Cook for 5 min/100°C or 212 °F/speed 1/MC off. Add carrot, sweet potato and pumpkin, chop for 10 sec/speed 6/MC on. Scrape bowl down. Add chicken stock and cook for 30 min/100°C or 212°F/speed 2/MC on. Add coconut cream and blend for 1 min/speed 9/MC on, increasing speed gradually. Repeat if required. At step 1 add on a couple of seconds chopping time, if required. At step 4 add on a cooking time if required. At step 5 allow to cool slightly (5-10 minutes) and then very slowly increase speed, then slowly decrease speed towards the end of the blending time. Blend for longer if required, taking the same precautions to ensure no build up of pressure when blending. I’ve made this soup a few times before and love it. I don’t have any pumpkin and was wondering if anyone’s made this with just sweet potato and the carrot? Yes! I’ve made it with just sweet potato and carrot (making sure the weight of pumpkin is substituted). It’s still delicious! I generally don’t like pumpkin soup but made this tonight for dinner and is devine! I just made this soup and it is amazing! I’m not a huge fan a coconut so was hesitant to try it but it is a great soup! Would veg stock work in place of chicken stock? This is a really tasty soup. I think if it was made thicker it could be a really good healthy curry sauce too. double thumbs up from my dad and hubby on this one – making again this weekend. I just wolfed down my second bowl. Absolutely delicious! And so simple! Mine was so runny! Any idea why or tips to combat? Everything was weighed off perfectly. This would have to be my all time favourite pumpkin soup recipe,so easy and so delicious. Has anyone made this just with pumpkin to make is LCHF suitable? Yes! Well, somewhat – i eat carrots, maintenance for me. So i used 500g kent pumpkin, 3 med/small carrots, chicken stock paste and same amount of water. But, before i started cooking i milled 100g of almonds and set aside, to thicken once cooked, as i thought it might be thin without the sweet potato. I then cooked the soup, and added the milled almonds after the coconut cream, and blitzed for another 10 secs. Let rest for at least 5 mins. I liked it! Love this soup. I only use a small tin of coconut cream (270 I think) and still tastes delicious. Super quick and super easy. Just made this for the first time and OMG the easiest and tastiest recipe ever nom nom nom!! Yum! I omitted the curry powder & garam masla and added Red Curry Paste instead. SO GOOD!!! I made this today for my lunch – oh my gosh yum! I couldn’t stop at 1 bowl! Made for the first time today, love the slight spicy flavour that the Babas curry adds. Great for winter! Made this soup for the first time today, it would have to be one of the best pumpkin soups I’ve tasted. Just wondering what nutritional value per serve. What can I say! 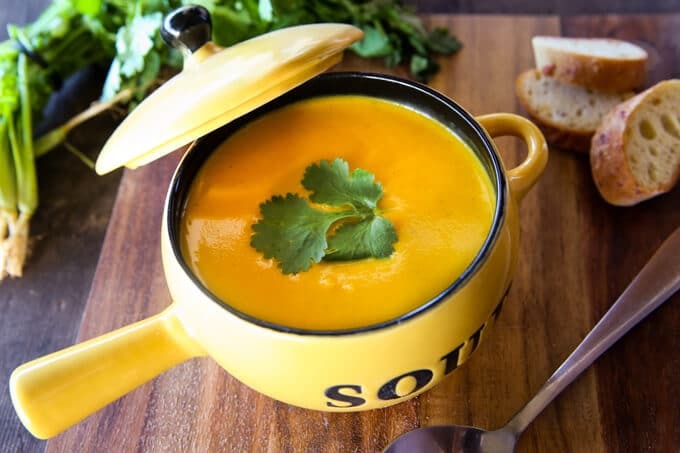 This is THE perfect pumpkin soup! Made it tonight for mothers day and it was just what I needed! I have just made the coconut curried pumpkin soup. It is very sweet and I was wondering if there was anything I could add to take the sweetness away. I love recipes that are versatile like this! I had 250g pumpkin, 1 capsicum, 1 zucchini & about 600g sweet potato. Threw it all in and it is amazing!! I didn’t add the coconut cream as I didn’t think it needed it. This is a keeper in my household for sure! Sorry that is Maureen . G.
Wonderful flavoursome soup, but too salty for me. Used my SM chicken stock for the first time and was concerned before I made it that there was too much salt as I don’t salt anything. Any tips to reduce the salt. I could use half the stock, but would that affect the flavour? This dish is ah-mazing!!! Thank you so much! Delicious!! Even my 2 and 4 year who i was sure would hate soup absolutely loved it!! This soup is great! I made it without the coconut cream and just used the 700g chicken broth and the thickness and taste were perfect! 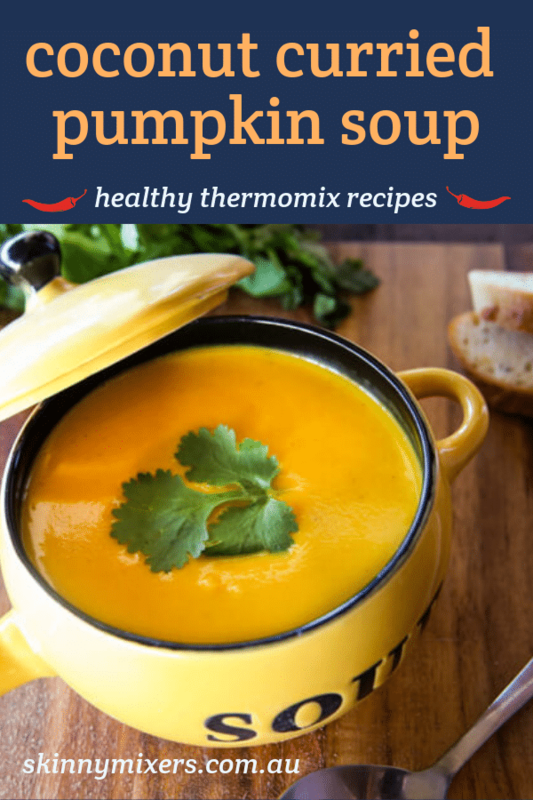 I love pumpkin soup and this is a great variation to the traditional one! Where can I buy “babas” curry powder? I think you could reduce stock to 500g or so – in the TM31 you wouldnt want any more vegies as it will be too full. I loved this soup, I’m a traditional pumpkin soup lover usually, this was great for a change, I have had terrible heart burn all day since eating it tho…. The biggest contribution to your calories here would be the oil and coconut cream. Simply leave both out. Sub the cream for a little milk if you want some creaminess, but I think it would be perfect without cream at all if you’re concerned about calories. This was delicious! I didn’t have a carrot so put in extra sweet potato and didn’t bother to peel or remove seeds from my butternut pumpkin. Instead I blended for 5 minutes! Extra goodness and no peeling pumpkin, win! Do you use full cream or light coconut cream? Just wondering if you can use vegetable stock paste instead? Was so yum. Thank you very much for this twist. Creamy deliciousness will easily become a regular. Also loving that it uses the babas curry powder. Thanks…….again! I finally made this, after 2 days procrastinating. Yummo! i was hoping the sweet potato and curry would mask the pumpkin a little, and it does. I’m not a fan of pumpkin but i know it’s good for me. Now I have yummy soup to get all the orange goodness. Keens is more of an English curry powder and tastes vastly different to babas curry powder, which is more Malaysian style. I really do not like Keens but it is very much personal preference. I made this last night without curry powder (had run out), added some turmeric instead. Tasted amazing! Such a great recipe Nik! Absolutely amazing. I had completely forgotten about it, after saving the original recipe last year. Or increase the pumpkin and sweet potato?? Very delicious recipe, hubby was most impressed.